Shield with the Coat of Arms of Annibale Card. Albani, Camerlengo of the Holy Roman Church (1719-1747), upon the Cross of the Order of St. John of Jerusalem, crossed keys above, surmounted by Cardinal's hat with six tassels on each side; the Ombrellone over all. The	Holy Spirt surrounded by rays of light above all. Figure, seated on a cloud, holding the Keys in right hand and a church in his left. Shield with the Coat of Arms of Annibale Card. Albani, Camerlengo of the Holy Roman Church (1719-1747), upon the Cross of the Order of St. John of Jerusalem, crossed keys above, surmounted by Cardinal's hat with six tassels on each side; the Ombrellone over all. The Holy Spirit, surrounded by rays and tongues of fire (Pentecost). 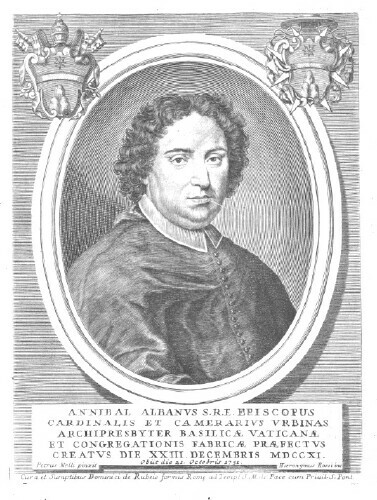 ANNIBALE CARDINAL ALBANI (1682-1751), was born at Urbino on August 15, 1682, son of Orazio Albani of Urbino and Maria Bernardina Ondedei Zonghi of Pesaro. He was educated in the Jesuit seminary at Rome. His uncle became Pope Clement XI in 1700 (dying on March 19, 1721). Annibale was created Cardinal Deacon on December 23, 1711, being appointed to the Deaconry of S. Eustachio on March 2, 1712. He became Archpriest of St. Peter's Basilica in 1712, where he had long been a Canon, and was promoted to be Cardinal Priest of S. Clemente in March, 1722; for this post he was finally ordained a priest in October of the same year. He was appointed Camerlengo of the Holy Roman Church on March 29, 1719, a post he held until 1747. He became Bishop of Sabina on July 24, 1730, and was translated to Porto and Sta. Rufina in 1743. From 1719 he was director of the English hospital of St. John in Jerusalem. Pietro Cardinal Ottoboni was the Dean of the Sacred College and Bishop of Ostia and Velletri He left the conclave on February 25 and died of his illness on the 29th. The Prefect of the Apostolic Palaces and Governor of the Conclave was Don Girolamo Colonna di Sciarra (1708-1763), a Roman noble, the younger brother of Cardinal Prospero Colonna. Their father was the 4th Prince of Carbognano. Don Girolamo was created Cardinal on September 9, 1743, and received the Diaconate of S. Angelo in Pescheria on December 2. He became Vice-Chancellor of the Holy Roman Church in 1753. He was Camerlengo of the Holy Roman Church from 1756 until his death. The Arms of Prince Girolamo Colonna on a baroque-style shield, surmounted by a clerical hat with six tassels on each side. 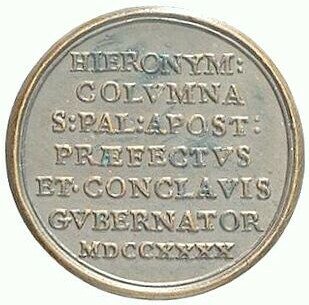 Inscription of Prince Girolamo Colonna, Prefect of the Sacred Apostolic Palaces and Governor of the Conclaveh, 1740. "L' origine de tant de médailles remonte à l'époque où le conclave se tenait toujours au palais du Vatican, et où l'on interdisait à tout le monde, pendant tout le temps de sa durée, l'entrée de la cité Léonine, c'est-à-dire du quartier appelé le Borgo. Alors tous ceux qui, soit pour leurs affaires, soit pour tout autre motif, devaient se rendre dans ce quartier du Borgo, étaient arretés en tête du pont Saint-Ange ou de tout autre pont communiquant avec le Vatican; on ne laissait passer que ceux qui étaient porteurs d'une médaille expressément frappée pendant la vacance du siége au nom de l'un des personnages nommés ci-dessus." X. Barbier de Montault, Le Conclave (Roma 1878) 19. The Treasurer General of the Holy Roman Church and Prefect of the Castel Saint' Angelo was Monsignor Mario Bolognetti, born in Rome on February 2, 1691. He was named a cardinal in the Consistory of September 9, 1743. The Governor of Rome was Msgr. Francesco Ricci, Vice-Chamberlain S. R. E.. The Marshal of the Holy Roman Church was Prince Augusto Chigi. The Maestri di Cerimonie were: Msgr. Ignacio Reali, Msgr. 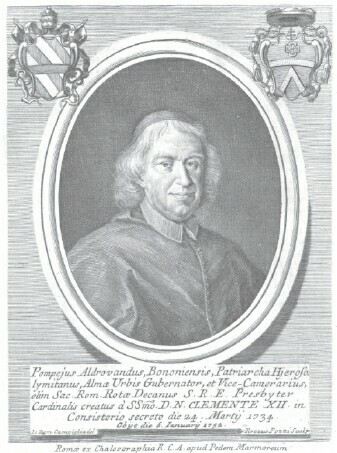 Venanzio Piersanti, Abb. Nunzio Sperandio, and Msgr. Francesco Diversini. Pope Clement XII Corsini had been blind since 1732, and was often bedridden. Government was in the hands of his nephew, Neri Maria Cardinal Corsini (r.), who was not particularly competent. The papacy managed to offend the Emperor Charles VI, Philip V of Spain, and the government in Naples. Clement died on February 6, 1740, at 9:30 a.m., lucid to the end. The Conclave of 1740 was a long and contentious one. There were 68 cardinals at the death of Clement XII, though four of them died during the Sede Vacante. At the opening of the Conclave, on February 18, 1740, there were thirty-two cardinals in attendance. Cardinal Pietro Ottoboni, the Dean of the Sacred College, sang the Mass of the Holy Spirit in St. Peter's (De Brosses, Lettre LI, p. 417). The 'Zelanti' were led by Cardinals Ruffo and Petra. (Cardinal Ruffo's conclavist was Father Giovanni Angelo Braschi, the future pope Pius VI.) Cardinal Niccolò del Giudice (born at Naples) was the head of the Imperial interest, along with Cardinal Sigismund Kollonitz of Vienna. The Emperor did not want a Spanish-leaning pope, and the Spanish did not want an Imperialist. 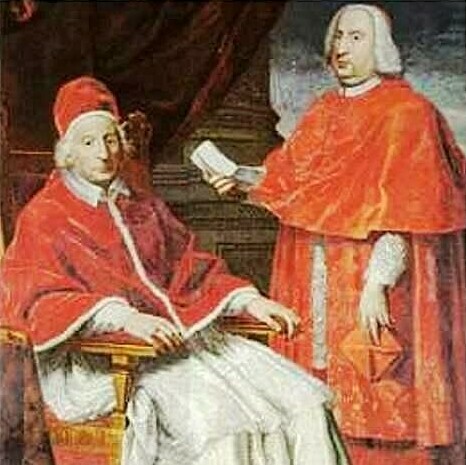 Cardinal Pierre de Tencin represented the French inside the conclave, and the Duc de Saint-Aignan was the French Ambassador (though he was just reassigned to be governor of Burgundy); both were in touch with Cardinal Fleury at Versailles and with the Foreign Minister Jean-Jacques Amelot de Chaillon (1737-1744), but they were struggling with each other over influence and credit. The early favorite was Cardinal Ottoboni, the Dean of the Sacred College (nephew of Pope Alexander VIII), but his death on February 28 ended his chances. It also ended the chances for an early election, since Ottoboni's votes had to find other candidates, and there were many, with no obvious alternative. A list (imperfect) of the Cardinals who were present at the Election of Benedict XIV (Lambertini) is given in the "Conclave in cui fu eletto Papa il signore Cardinale Prospero Lambertini da Bologna, detto poi Benedetto XIV" (from a ms. in the library the Counts Malvezzi de' Medici in Bologna), printed in F.S. Kraus (editor), Briefe Benedikts XIV an den Canonicus Pier Francesco Peggio in Bologna (1729-1758) [Lettere di Benedetto XIV al Canonico Pier Francesco Peggi Bolognese] zweite Ausgabe [secondo edizione] (Freiburg [Frioburgo] i. B. 1888), at pp. 171-173. Four cardinals died during the Sede Vacante of 1740 (Ottoboni, Altieri, Porzia and Cenci). Pietro Ottoboni (aged 72) [Venice], Bishop of Ostia e Velletri (1738-1740), with S. Lorenzo in Damaso in commendam [V. Forcella, Inscrizioni delle chiese di Roma V, p. 209 no. 599 (1730) p. 210, no. 602 (1737)]. Dean of the Sacred College of Cardinals, Secretary of the S.C. of the Holy Office (died during the Sede Vacante, February 29, 1740). Grand-nephew of Pope Alexander VIII. Tommaso Ruffo (aged 76) [Naples], Bishop of Porto e Santa Rufina (1738-1740), with S. Lorenzo fuori le mura in commendam. Sub-Dean of the Sacred College of Cardinals. Doctor in utroque iure (Sapienza, Rome). Died February 16, 1753. Giambattista Altieri (aged 67), son of Gaspare Paluzzi Albertoni and Laura Catherina Altieri. Cardinal Bishop of Palestrina (1739–1740), previously Cardinal Priest of S. Matteo in Merulana (1724–1739). Doctor in utroque iure (Rome). Made a prelate by Clement XI in 1703; Vice-Legate of Urbino (1704), under Cardinal Sebastiano Tanara; Cleric of the Apostolic Camera, and eventually Praeses viarum (1717-1724) [N. Nicolai, Sulla presidenza delle strade ed aque II (Roma 1829), p. 146]; Named a cardinal on September 11, 1724. Archbishop of Tyre in partibus infidelium, consecrated by Pope Clement X. He died of apoplexy during the Sede Vacante, on March 12, 1740, and was buried in the Minerva [Guarnacci II, p. 434]. Lodovico Pico della Mirandola (aged 71), Cardinal Bishop of Albano (1731–1740), previously Cardinal Priest of S. Prassede (1728–1731). Archpriest of the Liberian Basilica. Protector of England. Died August 10, 1743. Pier Marcellino Corradini (aged 82), Cardinal Bishop of Tusculum (Frascati) (1734–1743). Died February 8, 1743. Armand-Gaston-Maximilien de Rohan (aged 65), son of François, Duc de Soubise, Peer of France, and Anne de Rohan Chabot. Cardinal Priest of Sma. Trinità al Monte Pincio (1721–1749). Canon of the Cathedral of Strasburg. Coadjutor of Cardinal Wilhelm Egon de Furstenburg, the Bishop of Strasburg (1700), and named titular archbishop of Tiberias Caesarea by Clement XI. He was consecrated in Paris at S. Germain des Près, by Cardinal de Furstenburg. In 1703 he was elected to the Académie Française. Rohan succeeded as Bishop of Strasbourg (1704–1749). Grand Aumonier of France. Died in Paris on July 16, 1749. Thomas Philippe Wallrad d'Hénin-Liétard d'Alsace-Boussu de Chimay (aged 60), Cardinal Priest of S. Balbina (1733–1752). Archbishop of Mechlin (1715-1759). Luis Antonio Belluga y Moncada, Orat. (aged 77) [Spanish, Motril in the Kingdom of Granada], Cardinal Priest of S. Prassede (1738–1743), previously Cardinal Priest of S. Prisca (1726–1737), previously Cardinal Priest of S. Maria in Traspontina (1721-1726). Studied in Granada and Seville. Doctor in Theology, Sevilla (1686). In 1687 he became a Canon at Zamora, and then Prebend in the Cathedral of Cordoba. In Cordoba he introduced the Congregation of the Oratorians of S. Philip Neri. He supported the party of Philip V de Bourbon in the War of the Spanish Succession. In gratitude, Philip named him Bishop of Cartagena. He was consecrated on April 19, 1705. In 1706 he was named Viceroy of Valencia and Captain General of Murcia. On November 29, 1719, Pope Clement XI named him cardinal. He had sworn a personal vow not to accept any office that was incompatable with residence in his diocese, but the Pope dispensed him. In 1724 he resigned his bishopric and travelled to Rome, in time for the Conclave of 1724 [Guarnacci II, 340, erroneously states that he was absent; his conclavists and his dapifer are granted conclave benefits]. He established his residence in Rome, and sought to live a life of prayer and meditation. He was a member of the SC of Bishops and Regulars, of the Council, of Rites, and of Ecclesiastical Immunity (a congregation founded on June 22, 1622, by Urban VIII, taking over tasks previously dealt with by the SC on Bishops (founded by Sixtus V on January 22, 1588). He was offered the Archbishopric of Toledo, but he refused. Protector of Spain before the Holy See. He died in Rome on February 22, 1743, at the age of 80, and was buried in the Chiesa Nuova (S. Maria in Vallicella) [V. Forcella Inscrizione delle chiese di Roma IV, p. 179, no. 449]. [Biografia eclesiastica 14 (Madrid 1862), 239-240]. Vincenzo Petra (aged ), Cardinal Priest of S. Pietro in Vincoli (1737–1740). Major Penitentiary (1730–1747). Protector of the Greeks. Died March 21, 1747. Niccolò Coscia (aged 59), Cardinal Priest of S. Maria in Domnica pro hac vice Title (1725–1755). Died February 8, 1755. Angelo Maria Quirini, O.S.B.Cas. (aged 60) [Venice], Cardinal Priest of S. Marco (1728–1743). Bishop of Brescia (1727-1755). S.R.E. Bibliothecarius and Archivist (1730-1755). Prefect of the SC of the Index of Prohibited Books. Editor of the letters of Cardinal Reginald Pole. Francesco Antonio Finy (aged 71), Cardinal Priest of S. Maria in Trastevere (1738–1740). Died April 5, 1743. Prospero Lambertini (aged 65) [Bologna], Cardinal Priest of S. Croce in Gerusalemme (1728–1740). Archbishop of Bologna (1731–1754). Died as Bishop of Rome on May 3, 1758. Niccolò Maria Lercari (aged 64) [Genoa], Cardinal Priest of SS. Giovanni e Paolo (1726–1743). Secretary of State of His Holiness (1726-1757). Sigismund von Kollonitsch (aged 63), Cardinal Priest of SS. Marcellino e Pietro (1730–1740). Archbishop of Vienna (1722-1751). He was responsible for ghettoizing the Jews of Vienna. Died April 12, 1751. Philip Ludwig von Sinzendorf (aged 40), Cardinal Priest of S. Maria sopra Minerva (1730–1747). Bishop of Wroclaw (1732-1747) Bishop of Györ (1726-1732). Died September 28, 1747. Vincenzo Ludvico Gotti, OP (aged 75), Cardinal Priest of S. Sisto (1738–1742). Died September 18, 1742. Pierluigi Carafa (aged 63), iuniore [Naples] Died December 15, 1755. Giuseppe Accoramboni (aged 67), Cardinal Priest of S. Maria in Traspontina (1728-1740). Died March 21, 1747. Camillo Cibò (aged 59), [Massa di Carrara, Diocese of Luni], brother of the Duke of Massa. Cardinal Priest of S. Maria del Popolo (1731–1741). Patriarch of Constantinople (1718-1729). Died January 12, 1743. Francesco Borghese (aged 43) [Romanus], Cardinal Priest of S. Silvestro in Capite (1732–1743). Died June 21, 1759. Carlo Vincenzo Ferreri, OP (aged 58), Cardinal Priest of S. Maria in Via (1729–1742) Bishop of Vercelli (1729–1742) Died December 9, 1742. Bartolomeo Massei (aged 77), Cardinal Priest of S. Agostino (1731–1745). Archbishop-Bishop of Ancona e Umana (1731–1745). Died November 20, 1745. Vincenzo Bichi (aged 72), Cardinal Priest of S. Lorenzo in Panisperna (1737–1740). Former Nuncio in Switzerland, then in Portugal. Died February 11, 1750. Giuseppe Firrao (aged 69) [Naples], Cardinal Priest of S. Tommaso in Parione (1731–1740). Former Bishop of Aversa (1730-1734). Died October 24, 1744. Antonio Saverio Gentili (aged 59), Cardinal Priest of S. Stefano al Monte Celio (1731–1747). Datary of His Holiness (1731–1740). Died March 13, 1753. Giovanni Antonio Guadagni, OCD (aged 65), Cardinal Priest of S. Martino ai Monti (1731–1750). Former Bishop of Arezzo (1724-1732). Vicar General for the city of Rome (1732–1759). Died January 15, 1759. Troiano Acquaviva d'Aragona (aged 44), Cardinal Priest of S. Cecilia (1733–1747). Archbishop of Monreale (1739–1747). Died March 20, 1747. Domenico Riviera (aged 68) [Urbino], Cardinal Priest of SS. Quirico e Giulitta (1733–1741). Died November 2, 1752. Marcello Passeri (aged 62), Cardinal Priest of S. Maria in Ara Coeli (1733–1741) Died September 25, 1741, buried in S. Maria in Portico (Campitelli). Pompeio Aldrovandi (aged 71), Cardinal Priest of S. Eusebio (1734–1752). Archbishop-Bishop of Montefiascone e Corneto (1734–1752). Former Dean of the Sacred Roman Rota (1726–1734). He was named pro-Datary by Benedict XIV. Died January 6, 1752. Serafino Cenci (aged 64 [Romanus]), Cardinal Priest of S. Agnese fuori le mura (1735–1740). Archbishop of Benevento (1733–1740). Died June 24, 1740, during the Conclave. Pietro Maria Pieri, OSM (aged 63), Cardinal Priest of S. Giovanni a Porta Latina (1734–1743). Died January 27, 1743. [The Conclave narrative claims that he did not enter the Conclave: Kraus, p. 172]. Giuseppe Spinelli (aged 46) [Neapolitanus]; son of Giovanni Battista Spinelli, Marchese Fuscaldi, Prince of S. Arcangelo, and Maria Imperiali daughter of the Prince of Francavilla; Giuseppe's brother Tommaso was the Marchese Fuscaldi. Cardinal Priest of S. Pudenziana (1735–1752). He was placed in the Seminario Romano at the age of 13. Cameriere segreto to Clement XI. Sent to Vienna in 1719 with the red biretta for Cardinal Giorgio Spinola. In 1720 he was Inter-Nuncio in Flanders, where he remained until 1725. In that year, the government of Flanders was entrusted to Maria Elizabeth of Austria, the sister of the Emperor Charles VI, and Spinelli was promoted to Nuncio and made titular Archbishop of Corinth in Greece in the Ottoman Empire. He returned to Rome in 1731 and was appointed Secretary of the SC of Bishops and Regulars. In 1734 he was appointed Archbishop of Naples. Created a cardinal on January 17, 1735, by Pope Clement XII. He resigned the archbishopric in 1754, and was succeeded by Cardinal Sersale. In Rome he became Prefect of the SC de propaganda fide (1756-1763). Protector of the Romitani and of the Scots. In 1753 he was named Bishop of Palestrina. He died on April 12, 1763, and was buried in the Basilica XII Apostolorum [V. Forcella, Inscrizioni delle chiese di Roma II, p. 283 no. 870]. Rainiero Pannocchieschi D'Elci (de Ilcio) (aged 70) [Florentinus, Senensis], son of Filippo, Marchese Monticiani, and and Francesca Torrigiana; his uncle was Francesco Pannocchieschi d'Elci, Archbishop of Pisa (1663-1702). Doctor of law (Siena). He took up the practice of law in Rome. On May 27, 1700 he was named Referendary of the Signatures of Justice and Grace. In 1701 Pope Clement XI named him Pro-Legate in the Province of Aemilia; after four successful years, he was transferred to Fano as Governor. He returned to Rome and was appointed to the SC of the Consulta. In 1711 he was appointed Inquisitor of Malta. On his return, he was made a Cleric of the Apostolic Camera. He was promoted Prefect of the Archives, then Prefect of the Ripae, and then Prefect of Grace. Bishop of Ostia e Velletri, Dean of the Sacred College of Cardinals. In 1719 he was appointed Vice-Legate of Avignon, where he did everything possible to mitigate the effects of the plague of 1721. He was then appointed Nuncio in France (1731-1737), and consequently named Archbishop of Rhodes (1730-1738). On December 20, 1737 he was created cardinal by Pope Clement XII (Corsini), with the title of S. Sabina (1738–1747). On May 5, 1738, he was appointed Archbishop of Ferrara (1738-1740); episcopal duties were not to his taste, however, and he unsuccessfully petitioned Clement XII to remove the burden from him; Benedict XIV, however, allowed him to resign, but immediately appointed him Apostolic Legate in Ferrara for a three-year term. Died June 22, 1761. Domenico Passionei (aged 57) [born at Forum Sempronii, Fossombrone, December 2, 1682], son of Conte Giovanni Benedetto Passionei, and Virginia Sabbatelli. Cardinal Priest of S. Prassede and of S. Bernardo alle Terme in commendam . At the age of 13 he was sent to Rome and put in the charge of his elder brother Guido, who was Secretary of the Cipher, Secretary of the College of Cardinals, and Secretary of the Consistorial Congregation. Domenico was sent to the Collegio Clementino, run by the Somaschi fathers. In 1701 he published a small volume of philosophical propositions, dedicated to Pope Clement XI. He then studied privately under the direction of Father Giuseppe Maria Tommasi di Lampedusa, Theat., a member of the Arcadian Academy [Crescimbeni, Vite degli Arcadi illustri III, pp. 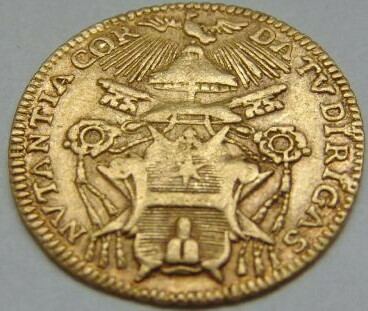 21-75], who became a cardinal in 1712. He became a friend of Msgr. Giusto Fontanini, who was also a member of the Arcadian Academy. In 1706 they published an edition of the Liber Diurnus. Domenico early attracted the attention of Magliabechi [a letter of March 1, 1704], also an Arcadian, and of the Dutch scholar Jacob Gronovius, formerly Professor of History at Pisa, with whom he corresponded on subjects of ancient history. He learned Greek, Hebrew and Syriac. In 1706 he carried the red biretta to Paris for Cardinal Filippo Gualtieri, on commission of Clement XI; he remained several years, discovering manuscripts and making the acquaintance of Bernard Montfaucon and Jean Mabillon. In 1708, still in Paris, he published a translation of S. Hippolytus, the disciple of S. Irenaeus. In 1708 he was in Holland, as France and the Emperor were negotiating the status of Catholics in that Protestant country (The Congress of Utrecht, which led to the peace between the Emperor and Louis XIV in 1714). Abbot of S. Michele Archangelo Lamularum. Utriusque Signaturae Referendarius. Nuncio extraordinary to Holland. He returned to Rome at the end of 1714. From 1716 to 1719 he spent time at home in Fossombrone, or in the library at Verona. In September of 1719 he was in Florence, where he was elected a member of the Accademia della Crusca. At the end of 1719 he was back in Rome, working in the Secretariat of the SC de Propaganda Fide. The new Pope, Innocent XIII, a member of the Arcadian Academy since 1719, appointed him Nuncio in Switzerland (1721-1730), in succession to Msgr. Giuseppe Firrau, for which purpose, on July 15, 1721, he was created Titular Archbishop of Ephesus in Ottoman Turkey. Nuncio in Vienna (1731-1738). Named Cardinal on June 23, 1738. Coadjutor-Librarian (1741-1755) to Cardinal Quirini (Bibliothecarius 1730-1755), then Bibliothecarius S. R. E. (1755-1761), Secretary of Briefs to Clement XII, Benedict XIII (a member of the Arcadian Academy since 1709), and Clement XIII. He died on July 5, 1761, at the age of 79, as his funeral inscription in S. Bernardo alle Terme indicates [V. Forcella, Inscrizioni delle chiese di Roma IX, p. 184, no. 369]. Silvio Valenti Gonzaga (aged 50) [Mantua], Cardinal Priest without titulus. Legate in Bologna. Doctor in utroque iure (Ferrara). Died August 28, 1756. Gaetano Stampa (aged 72) [Milanese], Cardinal Priest without titulus. Archbishop of Milan (1737-1742). Nuncio in Venice (1720-1735). Died December 23, 1742. Pierre-Guérin de Tencin (aged 59) [French], Cardinal Priest of SS. Nereo ed Achilleo (1739–1758). Archbishop of Embrun (1724-1740). 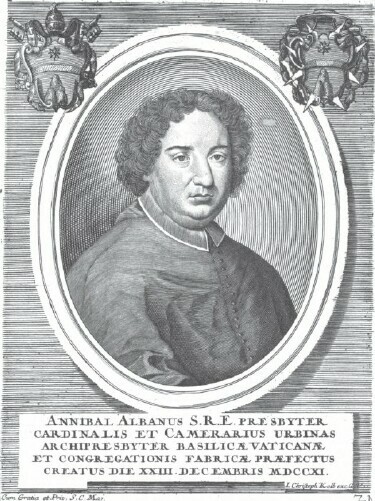 Alessandro Albani, O.S.Io.Hieros (aged 47) [Urbino], Cardinal Deacon of S. Maria in Cosmedin (1722–1741). He succeeded Cardinal Tanara as Abbot Commendatory of the Abbey of Nonantola (1724-1779). Died December 11, 1779. Niccolò del Giudice (aged 80), Cardinal Deacon of S. Maria ad Martyres (1725–1743), previously Prefect of the Apostolic Palaces. Neri Maria Corsini (aged 55), Cardinal Deacon of S. Eustachio (1737–1770). Prefect of Supreme Tribunal of the Apostolic Signatura (1733–1770). Protector of Portugal. Bartolomeo Ruspoli (aged 42), Cardinal Deacon of SS. Cosma e Damiano (1730–1741). He had been Governor of the Borgo and Governor of the Conclave of 1721. Died May 21, 1741, buried in the church of Sma. Concezzione dei Cappuccini in Rome. Agapito Mosca (aged 62) [Pisauro], consanguineus of Clement XI. Cardinal Deacon of S. Giorgio in Velabro (1732–1743). Died August 21, 1760, at the age of 82. Buried in the Church of the Capucines [G. Frascarelli, Inscrizioni picene che esistono in diversi luoghi di Roma (Roma 1868), p. 145]. Giovanni Battista Spinola (aged 60), Cardinal Deacon of S. Cesareo in Palatio (1733–1743). Prefect of the SC dell' Immunità (a congregation founded on June 22, 1622, by Urban VIII, taking over tasks previously dealt with by the SC on Bishops (founded by Sixtus V on January 22, 1588). . Protector of the Canons Regular of the Holy Savior (CRSS). Died August 20, 1752. Giacomo Lanfredini (aged 59), Cardinal Deacon of S. Maria in Portico (1734–1741). Died May 16, 1741, buried in the Church of Sma. Trinità in Monte Citorio. Carlo Rezzonico (aged 47), Cardinal Deacon of S. Nicola in Carcere (1738–1747). Died February 2, 1769 as Bishop of Rome. Marcellino Corio (aged 75), Cardinal Deacon of S. Adriano al Foro (1739–1742). Prospero Colonna (aged 77) [Romanus], Cardinal Deacon of S. Angelo in Pescheria (1739–1743). Carlo Maria Sacripante (aged 50), Cardinal Deacon of S. Maria in Aquiro (1739–1741). Died November 4, 1758. Lorenzo Altieri (aged 69) [Rome], son of Gaspare Paluzzo Albertoni, Prefect General S.R.E., who was adopted by Clement X (Altieri); his mother was Laura Catherina Altieri, niece of Clement X. He was also related through marriage to Alexander VIII. Cardinal Deacon of S. Maria in Aquiro (1690-1707), created on November 13, 1690, at the age of 19. His uncle Cardinal Paluzzo Paluzzi Altieri took him in hand. Cardinal Deacon of S. Nicola in Carcere (1707-1718). Cardinal Deacon of S. Agata alla Suburra (1718-1730). Cardinal Deacon of S. Maria in Via Lata (1730-1741). He died on August 3, 1741, at the age of 70, and was buried in S. Maria in Porticu [V. Forcella, Inscrizioni delle chiese di Roma V, p. 382, no. 1048]. Nuño da Cunha e Ataíde (aged 75) [Portugal], son of Luis, Conde de Pavolide, and Gujomar de Lencestre. Cardinal Priest of S. Anastasia (1721–1750). Doctor of Canon Law. Canon of the Cathedral of Lisbon. Inquisitor General in Portugal. Commander of the Order of Christ. Grand Chamberlain of King Pedro II. Bishop of Elvas (1705). Bishop of Targa (1705-1712). Principal Chaplain of the King. Named a cardinal at the request of the King of Portugal on May 18, 1712. Died December 3, 1750. Melchior de Polignac (aged 78) [France], son of Louis-Armand Vicomte de Polignac, Marquis de Chalançon; and Jacqueline de Beauvoir Grimoald. Cardinal Priest of S. Maria degli Angeli (1725–1741). Educated at the College de Louis le Grand in Paris, and at the Sorbonne. He was a conclavist of the Cardinal de Bouillon at the Conclaves of 1689 and 1691. In 1693 he was sent to Poland as royal Nuncio, where he remained until after the death of King John III Sobieski in 1696. He had attempted to have François de Conti elected King, but lost out to Augustus of Saxony; in 1698 he was recalled. In 1706 he was named by Louis XIV to the French seat on the Sacred Roman Rota. In 1709 the King sent him as Nuncio to Holland to arrange a peace, and again in 1713, to the negotiations that led to the Peace of Utrecht. He was created a cardinal in petto by Clement XI on May 18, 1711, but the announcement was deferred until January 30, 1713. Cardinal Melchior was a subject of suspicion on the part of the Regent of France, Philippe d'Orleans, and he was ordered to retire to one of his abbeys. He returned to Paris in 1724 under Louis XV, and went to Rome in 1724 for the Conclave that elected Benedict XIII. Archbishop of Auch (1726-1741). He also participated in the Conclave of 1730, which elected Clement XII. In 1733 he was appointed Commander of the Order of the Holy Spirit. Died in Paris on November 20, 1741, and buried in S. Sulpice. Benedetto Erba-Odescalchi (aged 60) [Comasco-Mediolanensis], son of Marchese Antonio Erba-Odescalchi and Teresa Turconia, great-grand-niece of Pope Innocent XI. Cardinal Priest of SS. XII Apostoli (1725–1740). He was taken to Rome at the age of eleven, and enrolled in the Collegio Romano. He became a lawyer. He entered the Curia at the beginning of the reign of Clement XI, and was soon appointed Pro-Legate of Bologna, where he became a friend of Vincenzo Gotti, the future cardinal. Nuncio of Clement XI to Poland until 1712. Archbishop of Milan (1712-1736). Died December 13, 1740, and buried in the Carmelite church of S. Giovanni. Giulio Alberoni (aged 76), Cardinal Priest of S. Crisogono (1728–1740). He had received his red hat from Clement XI on July 12, 1717, at the specific request of King Philip V and Queen Elizabeth (of Parma) of Spain. It was in fact extortion. Alberoni began his career as a poor priest in the cathedral of Piacenza. He advanced when he found a place in the entourage of the Vice-Legate of Ravenna, Giorgio Barni, Bishop of Piacenza (1687-1731). Initially he was attached to the Duke de Vendôme, who was conducting the Italian theater of the War of the Spanish Succession (in concert with the Duke of Parma); thanks to the Duke's influence he was appointed Canon in the Cathedral of Parma. Alberoni subsequently served with him in the war in Flanders (from 1707), and then followed him to the Court of Spain; he lost his patron to death on June 11, 1712. Alberoni was nothing but an adventurer from Parma who had ridden to power in Madrid on the wedding veil of King Philip V's second Queen, Elizabeth Farnese, to whom he had attached himself like a leech. He had then helped Elizabeth Farnese to rid Spain of her rival, Princess Orsini. Alberoni had also engineered the fall of Cardinal del Giudice as Grand Inquisitor of Spain and principal minister of Philip V. He had himself named Bishop of Malaga, but the bulls were never provided; he received the income of the Bishopric of Malaga, nonetheless, during the vacancy of 1717-1725 [Gams, 49]. His fall from power in Spain was sudden and complete, his dismissal being handed to him on December 5, 1719, along with an order to leave Madrid within eight days and Spain within twenty-one. At Lerida, his belongings were searched, on the grounds that he had left Madrid with state papers in his possession. After leaving Barcelona, he was plundered by bandits. At Narbonne, too, his baggage was searched, this time by Customs officers under orders from the Chevalier de Marcieu, who had been ordered by the Regent of France to accompany Alberoni, and extract whatever information he could from the Cardinal. Sailing for Italy, he was met at Sestri Levante in Genoese territory by a papal official, who forbade his entry into the Papal States, on penalty of imprisonment [Professione, 264]. When Alberoni retreated to Genoa, France, the Emperor, and the Pope each tried to have him detained. On March 19, 1720, Clement XI appointed a Commission of Cardinals to try his case: Albani, Astalli, Barberini, Bentivoglio, Conti, Corradini, Corsini, Fabroni, Paracciani, Paolucci, Scotti, Tanara, Tolomei, Vallemani, and Zondadari; they were joined by three other prelates: Alamanni, Marefoschi and Riviera [Professione, 277]. The Genoese, however, allowed him to go on his way, and he reached Modena and Lucarno; he found refuge in a castle in the Alps (Castelnuovo Scrivia, in Austrian territory in Lombardy) until the death of Clement XI. He then emerged, to head by way of Bologna to Rome for the Conclave. The majority of the Cardinals voted to allow him to participate, but many of them refused to have anything to do with him personally. The new Pope, Innocent XIII (Conti) turned him over to a commission of Cardinals, which convicted him and imposed a three-year sentence in a monastery. This was reduced by the Pope to a single year. When the Regent of France, Philippe d'Orleans, died in July of 1723, another of Alberoni's enemies was removed. But he did not receive a deaconry, S. Adriano al Foro, until 1724. He was not consecrated a bishop until 1725. In 1727, he was sent to reconcile the Old Pretender with his wife. 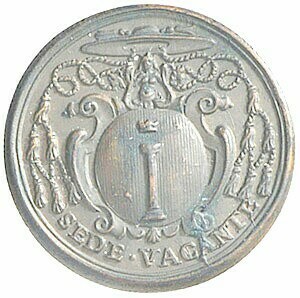 Made Governor of the Romagna by Innocent XII in 1735. (died June 26, 1752, at the age of 88) [Cardella, Memorie de' cardinali VIII, 169-176]. Léon Potier de Gesvres (aged 83) [France], son of Léon, Duc de Gesvres, Peer of France, Governor of Paris; and Marie-François-Angelique du Val, daughter of François, Marquis de Fontenay-Mareüil. Cardinal Priest without titulus, nominated in 1707 by King Stanislas of Poland and confirmed by King Augustus. Doctor of Law, Paris Sorbonne. Protonotary Apostolic de numero participantium. Archbishop of Bourges (1694-1729), consecrated by Cardinal César d'Estrées. (died November 12, 1744). Damian Hugo Philipp von Schönborn (aged 63) [German-Austrian, Mainz]. His uncle was Elector of Mainz. His brother Karl was Bishop of Würzburg (1729-1746) and Bamberg (1729-1746). Cardinal Priest of S. Maria della Pace (1726–1743), at the request of the Emperor Charles VI. Coadjutor Bishop of Speyer (1716). Bishop of Speyer (1719-1743) and Coadjutor Bishop of Konstanz (1723-1740), succeeded on July 12, 1740. Provost of the church at Weissemburg, and the church at Oldheim. Prince of the Holy Roman Empire. Grand Commander of the Teutonic Knights of the Baillie of the Low Countries. Died August 19, 1743. André Hercule de Fleury (aged 87), Cardinal Priest with no titulus (1726–1743). First Minister of State, France. Died January 29, 1743. Luis Antonio Jaime de Borbón y Farnesio (aged 13), Cardinal Deacon of S. Maria della Scala (1735–1754). Infante of Spain. Died August 7, 1785. Joseph Dominicus von Lamberg (aged 60) [Styria, Austria], nephew of Cardinal Johann Philipp von Lamberg, Bishop of Passau (1689-1712). He studied at Besançon in Burgundy, in Siena, and in Rome at the Collegio Clementino. He was elected a Canon in his uncle's Cathedral in Passau in 1703, and in 1705 he was elected Provost. He was also named a Canon in the Cathedral of Salzburg. Pope Clement XI appointed him Bishop of Seckau (Graz) in Styria (1712-1723), and then in 1723 he was appointed Bishop of Passau (1723-1761). On the recommendation of the Emperor Charles VI, he was named Cardinal Priest of S. Pietro in Montorio, created on December 20, 1737. He died on August 30, 1761, and was buried in the Cathedral of SS. Stephanus et Laurentius in Passau. Tomás de Almeida (aged 69), Cardinal Priest without titulus (1737–1754). Patriarch of Lisbon [Portugal]. Died February 27, 1754. Gaspar de Molina y Oviedo, OESA. 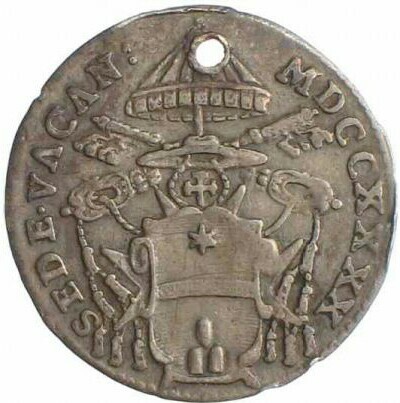 (aged 61) [Spain], Cardinal Priest with no titulus (1737–1744). Bishop of Málaga (1734-1744). Jan Aleksander Lipski (aged 50?) [Poland], Cardinal Priest with no titulus (1737–1746). Bishop of Krákow (1732-1746). According to Boutry (176-177), the conclave began with two large factions, the younger cardinals and the older cardinals. Neither was confident enough to begin putting forth serious candidates (soggetti). Tencin believed it to be his task to keep Cardinals Albani (the Camerlengo) and Acquaviva (the leader of the Spanish faction) together, so that the Camerlengo could influence the actions of Cardinal Neri Corsini, the Papal Nephew. Tencin had remarked some time earlier in a letter to Louis XV that Corsini had enough supporters to exclude anyone he chose, and that he would also be necessary to someone who wanted to be elected (Boutry, 180). Secret French instructions to Tencin recommended Cardinals Bartolomeo Massei (Bishop of Ancona, former Nuncio to France), then Spinola, followed by Corio (of Milan, Governor of Rome), Sacripanti and Aldrovandi. Those cardinals to be excluded were Ruffo, Coscia, Petra, Mosca, Gentile, and Passerini (Boutry, 180-181). But Cardinal Fleury had also given instructions not to employ the formal exclusiva, .despite Tencin's judgment that it should be used on Ruffo or Gentile. 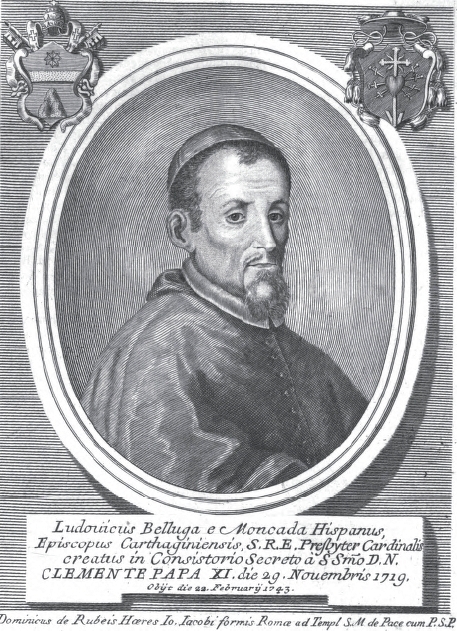 Cardinal Troiano Acquaviva d'Aragona, the representative of the Neapolitan Bourbons and the Spanish Crown (Novaes, 8), kept his own counsel during the proceedings, and declined to cooperate with the designs of the French and the Spanish Bourbons. He did, however, provide the ultimate resolution. Corsini promoted his soggeti, one after the other. Spinola had his chance, and Porzia, and Ruffo (a favorite of the Zelanti), and Cenci, none of whom made any great impression. But with each attempt, Corsini lost more of his influence with the other cardinals. But finally the more recent cardinals promoted the candidacy of Cardinal Corio, the Governor of Rome. He managed to reach twenty-six votes, but the assistance of Cardinal Acquaviva was not (as expected) forthcoming, and his candidacy was suspended (Boutry, 212). On March 13, Cardinal Giovanni Battista Altieri, the Cardinal Bishop of Palestrina died. Cardinal Lambertini (of Bologna, Bishop of Ancona) entered the conclave on March 5; Cardinal Kollnitz (Vienna), Mosca and Lanfredini (Vicar General of Rome) entered on March 8; D'Elci (Ferrara) on March 20; Marini (Legate in the Romagna) on the 21st; Rohan (Strasbourg) on the 23rd; Lercari, Belluga and de la Tour d'Auvergne (Vienne) by the 27th; followed by Cenci (Benevento). Zinzendorff (Breslau) and Valenti Gonzaga (Legate in Bologna) appear in the voting lists on April 18, and Cibò (Patriarch of Constantinople) on the 20th. Cardinal Zinzendorff had been in Rome for well over a month, suffering from gout, but according to a report of Cardinal Ferrero to the King of Sardinia on April 16 (Petruccelli, 118-119), he would not enter into conclave until the conclave allowed him to bring live pigs into the restricted area. The entrails of a freshly slaughtered pig were part of the prescription for his treatment. Zinzendorff swore that he would not enter conclave until the day the pope was to be elected. He finally gave in on April 23. March and April passed, with no movement on any front. Personal mutual dislike of Tencin and Cardinal Acquaviva made it difficult to unite the French and Spanish factions. Cardinal Corsini himself, who was finding the conclave to be extremely trying, since he was without his female friends and luxuries, was bored and irascible, and easily fell prey to Cardinal Tencin's manipulations (dispatch of 'Walton', April 24 and May 1; Petruccelli, 120-121), as well as to the advice of his friends Alessandro Albani and Domenico Riviera Petruccelli, 120-121). At the end of May there were 55 cardinals in the conclave, of whom 44 were Italians. Thirty-seven votes were needed to elect. Cardinal Serafino Cenci died on June 24. Two others, Cardinals Lorenzo Altieri and Leandro di Porzia, left the Conclave because of illness. Various names were put forward. Cardinal Domenico Riviera (of Urbino, a curial cardinal) reached seventeen votes at one point, but nobody really wanted him as pope, since his morals were not entirely blameless. Cardinal Corradini, one of the 'old cardinals' (a creature of Clement XI from 1712), explained to Tencin that the only cardinal in the Corsini faction who was in the least acceptable to the Clementine and Benedictine creatures was Cardinal Antonio Gentili (a Roman, the Papal Datary) (Boutry, 202) Unfortunately, Gentili was among the 'unacceptable' cardinals, as enumerated by Fleury, and so Tencin, who had been against Gentili but was now considering him seriously, had to write to Fleury for revised instructions. In the meantime, Tencin would stall. In mid-June an agreement between Acquaviva and Lambertini produced the name of Cardinal Giuseppe Firrao (a Neapolitan, Bishop of Aversa). Corradini and Annibale Albani offered 24 votes. Tencin was approached and agreed to supply his votes. This might make 48 votes. Cardinal del Giudice was approached to find out what the Imperial faction would do; he asked for 48 hours to think about it. During the night del Giudice met with Tencin and told him to stop supporting someone who was disfavored by the Emperor. Tencin withdrew from his committment. Firrao's chances were ruined (Petruccelli, 126-127, quoting a letter of Cardinal Corsini to Paluzzi, intended for the eyes of the Duke of Modena). Then, at the suggestion of Tencin to Corsini, perhaps as many as fifteen voters put forward Cardinal Pier Marcello Corradini himself, but his age (82) was against him. This was not a real candidacy, in fact, but a ruse of Tencin, to get Cardinal Acquaviva to use his Spanish veto (Petruccelli, 123-124). By the first of July a group of thirty-one voters, including both Spanish and French interests, led by Cardinal Corsini, coalesced around Cardinal Pompeio Aldrovandi of Bologna, Bishop of Montefiascone and Corneto (left). But Cardinal Albani, the Camerlengo, a personal enemy of Corsini. led another faction of around twenty votes, which pressed for Cardinal Giacomo de Lanfredini (of Florence, a curial cardinal). Albani and Aldrovandi had a long-standing distaste for each other, but an attempt to patch it up failed. (Petruccelli, 128). They excluded each other. Cardinal Aldrovandini hovered at around 31 votes for six weeks. On August 11, he reached 33 votes, but could not find the one vote needed to make himself pope. Tencin complained that they would be in the conclave for ten years. Corradini replied that he would not last ten years, but would live long enough to defeat Aldrovandi. (Petruccelli, 129) On August 16, Aldrovandi wrote to Cardinal Corsini, asking him to withdraw his name from further consideration. Another version of events has it that, after many weeks of inconclusive balloting, in the heat of the Roman summer, with masses in Roman churches 'for the election of a Pope', and a three-day service to the Blessed Virgin Mary in the Conclave, one of the electors, Cardinal Troiano Acquaviva di Aragon, proposed his old friend Cardinal Lambertini, the archbishop of Bologna. Dans la matinée du 17 août 1740, a été élu à l' unanimité des suffrages le cardinal Prosper Lambertini, archevèque de Bologne, sa patrie, lequel, par vénération pour la mémoire de son prédécesseur, Benoit XIII, a pris le nom de Benoit. L' inattendue unanimité qui l' a porté sans aucune négocation préalable, si ce n' est celle de quelques heures, après le scrutin du soir, la veille de son election, et le changement decisif et instantane opere en sa faveur, de tant de cardinaux qui jusqu' alors avaient toujours vote pour Aldobrandi, demontrent clairement qu' on n' arrive point a la papaute par les efforts des hommes; mais que c'est le Saint-Esprit seul qui, quand il lui plait, inspire aux electeurs la connaissance de sa divine volonte, et leur indique, au moment qui convient a sa sagesse, l' homme qu'il avait, dans sa mysterieuse providence, choisi poour cette sublime dignite. Ce conclave dura six mois, et le nombre des cardinaux qui prirent part a l' election montait a cinquante. The Secretary's mystification is due, no doubt, to the discretion with which the final negotiations were carried on, by the principals and not by agents, and without the interference of the Courts. The election of Prospero Lorenzo Cardinal Lambertini (Pope Benedict XIV) came as a surprise, it is said. He was crowned in the Vatican Basilica on August 22, 1740, by Cardinal Carlo Maria Marini, the Cardinal Protodeacon; and on April 30, 1741 he took possession of the Lateran Basilica. Cardinal Silvio Valenti Gonzaga was named Secretary of State (1740-1756). "Conclave in cui fu eletto Papa il signore Cardinale Prospero Lambertini da Bologna, detto poi Benedetto XIV," in Francesco Saverio Kraus (editor), Lettere di Benedetto XIV al canonico Pier Francesco Peggi Bolognese (Friburgo i B. 1888),151-173. Kraus notes the existence of another Conclave narrative, in the Archives of the Ministry of Foreign Affairs in Paris, öhne Zweifel von Tencin herrührend" (p. xix, n. 3). Mario Guarnacci, Vitae et Res Gestae Pontificum Romanorum et S. R. E. Cardinalium a Clemente X usque ad Clementem XII Tomus secundus (Romae 1751). P. Paul, Le Cardinal Melchior de Polignac (Paris, 1922). 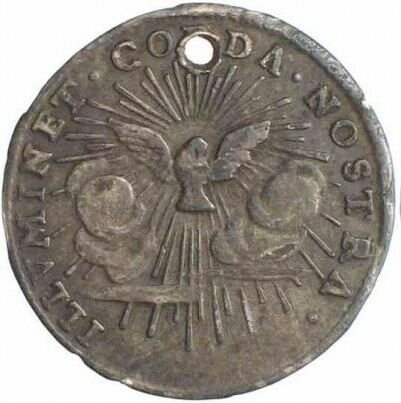 For the Conclave of 1740, see Giuseppe de Novaes, Elementi della storia de' sommi pontefici da San Pietro sino al ... Pio Papa VII third edition, Volume 14 (Roma 1822) 6-9. G. Moroni, Dizionario di erudizione storico-ecclesiastica Vol. 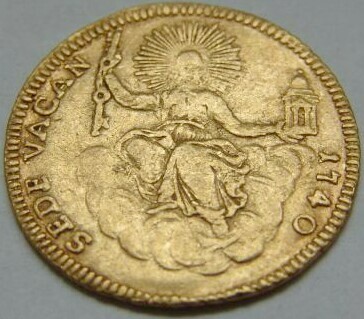 5 (Venezia 1840) 22. Président Charles De Brosses, L' Italie il y a Cent Ans (edited by R. Colomb) Volume II (Paris 1836), Lettres LI, LII, pp. 395-443 (he correctly divined that the winner would be Lambertini). F. Petruccelli della Gattina Histoire diplomatique des Conclaves IV (Paris 1866) 108-133. Maurice Boutry, Une créature du Cardinal Dubois: Intrigues et missions du Cardinal de Tencin deuxième edition (Paris 1902) 166-238. Also see T. Adolphus Trollope, The Papal Conclaves, as the were and as they are (London 1876) pp. 378-388, for an entirely different account, written mostly from French sources, with an English Protestant point of view. F. Tagell, Relació de la mort de Climent XII i de l'elecció de Benet XIV (1740) (Barcelona 1971). On Cardinal Alberoni, see Charles Bertin, Dictionnaire des Cardinaux (1858) 205-208. G.P.R. James, Lives of the Most Eminent Foreign Statesmen, Vol. IV (London 1837), pp. 130-267 [derived from John Russell, Memoires of the Affairs of Europe from the Peace of Utrecht I (London 1824)]. Camillo Pariset, Il Cardinale Giulio Alberoni (Bologna: Nicola Zanichelli 1905). Alfonso Professione, Il ministero in Spagna e il processo del Cardinale Giulio Alberoni (Torino: Clausen 1897) 293-295. Italo Raulich, "Il cardinale Alberoni e la Repubblica di San Marino," Archivio storico italiano 39 (Firenze 1907), 352-395. P. Castagnoli, Il cardinale Giulio Alberoni vols. I-III (Piacenza-Roma 1929-32). S. Harcourt-Smith, Cardinal of Spain: The Life and Strange Career of Alberoni (1944). Ludwig Wahrmund, Das Ausschliessungs-recht (jus exclusivae) der katholischen Staaten Österreich, Frankreich und Spanien bei den Papstwahlen (Wien: Holder 1888) 227-228. L. Dollot, "Conclaves et diplomatie française au XVIIIe siècle," RHD (1961), 124—135.